Rocks of Wenatchee Ridge consist of ultramafic lenses within granitic gneiss that have experienced high grade metasomatic metamorphism. 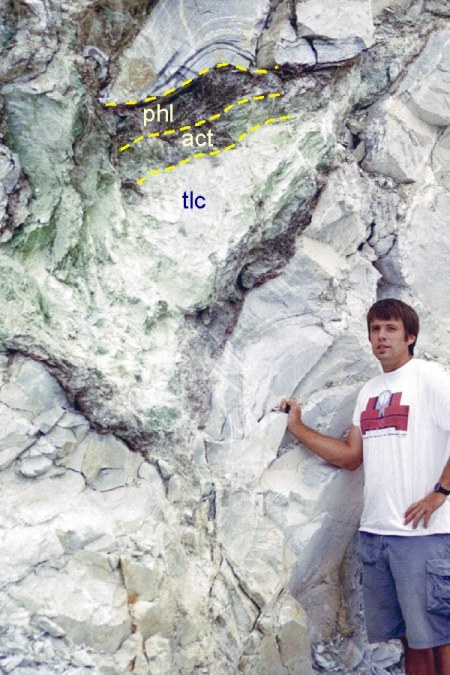 As a result of metasomatic infiltration of silica into the ultramafic lenses from the surrounding gneiss, the ultramafic lenses are zoned from rim to core, with decreasing silica content towards the core. This chemical gradation is reflected in mineralogical zoning within the lenses: (RIM) phlogopite + actinolite >>> actinolite >>> actinolite + talc >>> talc (CORE). Collecting is within the Wenatchee National Forest. 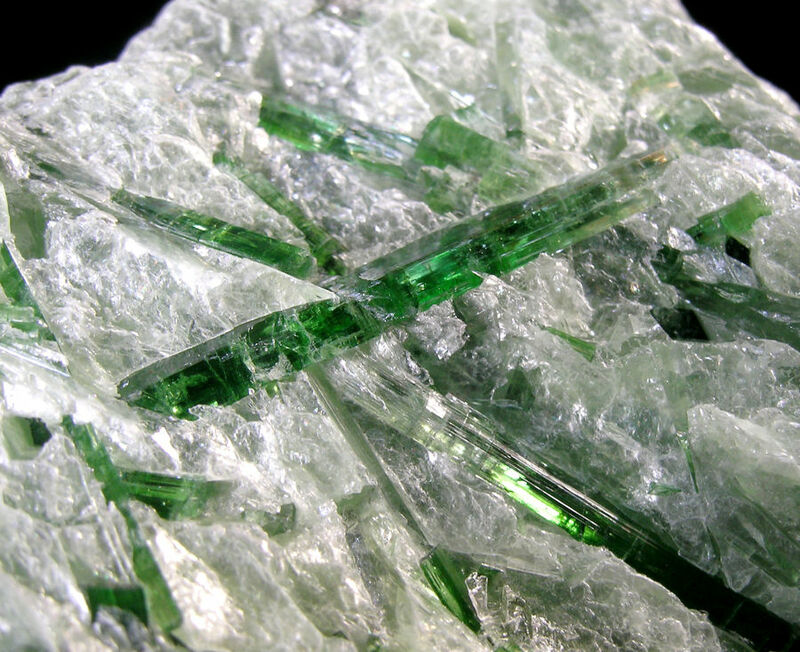 *Actinolite- Ca2(Mg,Fe)5Si8O22(OH)2 - Occurs as translucent elongated prismatic crystals found as monomineralic aggregates, or associated with phlogopite or talc. 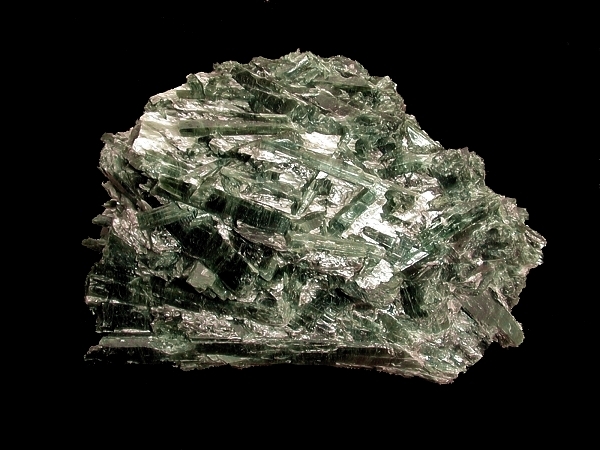 Crystals are dark green and do not possess terminations. 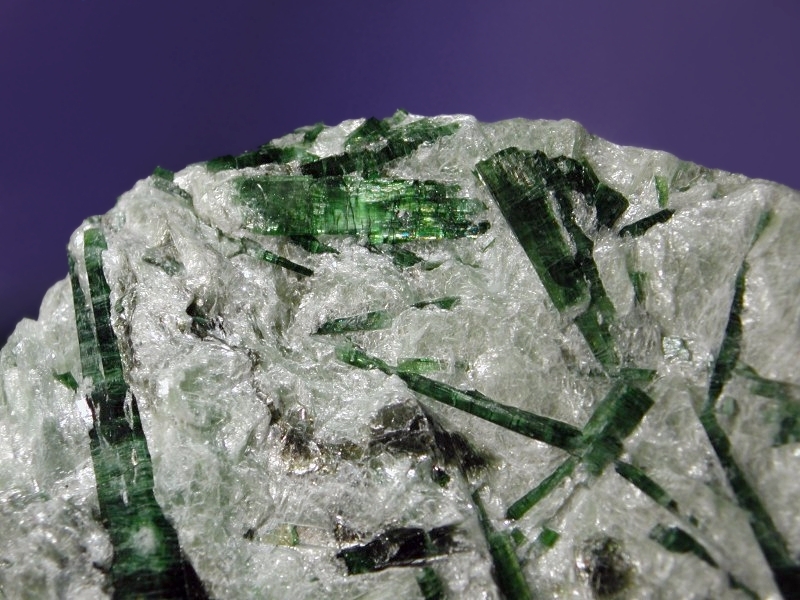 Actinolite in cores of ultramafic lenses are more translucent and brighter in color. 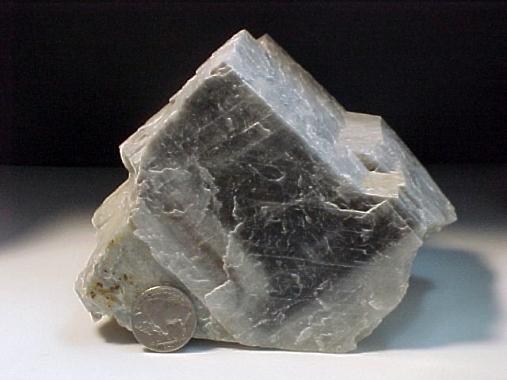 *Calcite- CaCO3 - Occurs as opaque white to grey cleavable masses from decimeter scale monomineralic calcite lenses. 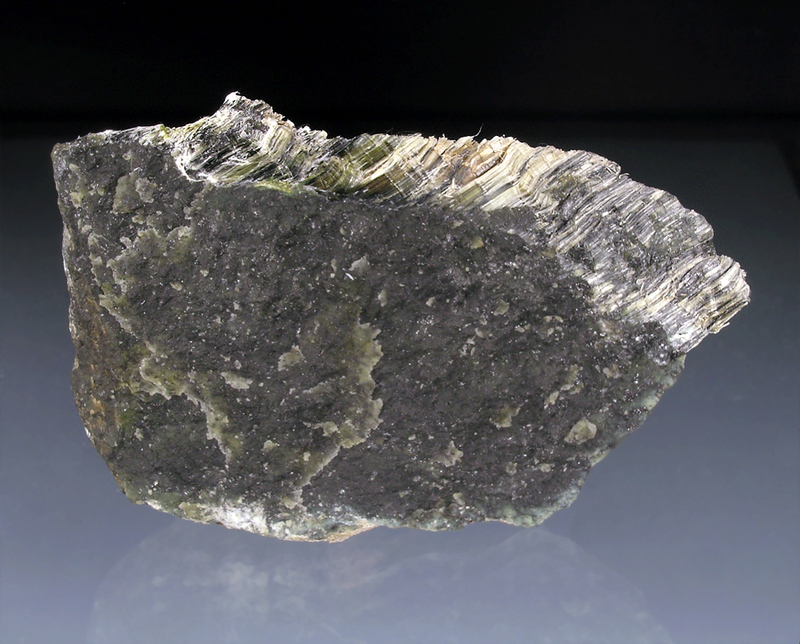 *Chrysotile- Mg3Si2O5(OH)4 - Occurs as chatoyant seams in ultramafic rock observed to about 1-inch thick. 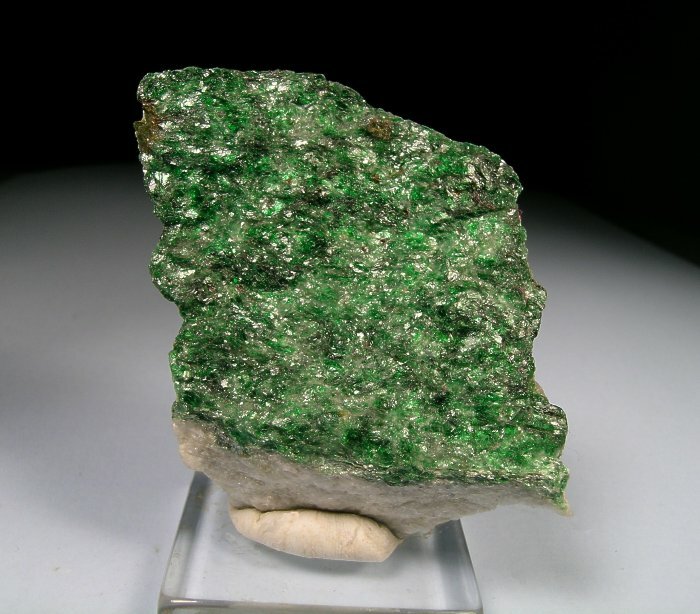 *Fuchsite- Chromium (Cr) rich muscovite, KAl2(AlSi3O10)(OH)2 - Occurs as bright green schistose masses. 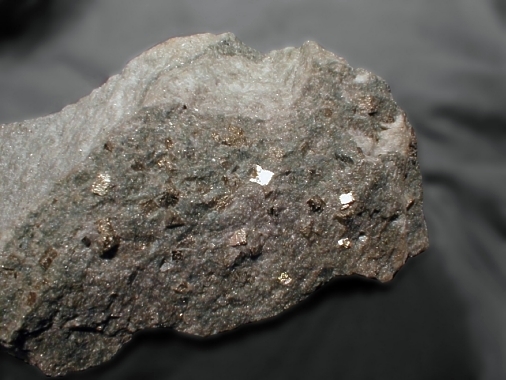 Phlogopite- KMg3(AlSi3O10)(OH)2 - Occurs as bronze-colored schistose masses. *Pyrite- FeS2 - Occurs as cubes to about 2 cm embedded in silicic matrix. Quartz- SiO2 - Occurs as milky crystals up to about 2 cm in small cavities. 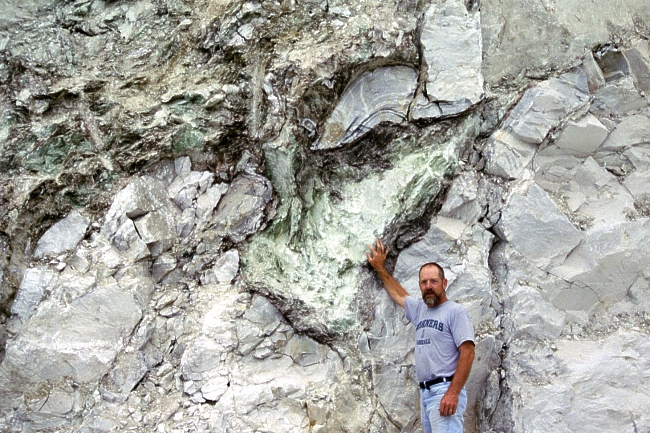 *Talc- Mg3Si4O10(OH)2 - Occurs as pearly light green to white masses associated with actinolite.